I remember how we saved up for the sofa we wanted and how we painted our apartment together, mounted wallpaper in the bedroom together (his side is neater than mine) and slowly transformed our living space. My husband and I turned on our Sade CD, put on our Tees and shorts and had a fab time. 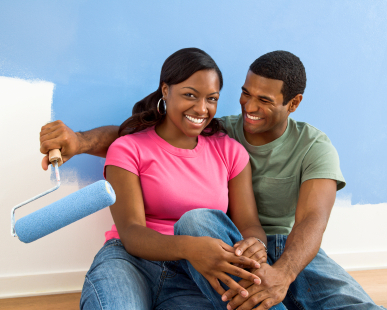 One thing that almost every newly wedded woman looks forward to is setting up her new home. Whether it's a duplex or an apartment, chances are you've picked a colour scheme curtains, paint, throw pillows all hand picked by you or both of you. I went about it so copiously that my skin was left several shades darker after walking all over the markets for the best deals and prettiest pieces. With my slim budget, I was trying to create my very own intimate home. When we were starting this new phase of our lives, share it with those closest to your heart. I hear many of you wondering if this is a piece on interior decorating. No, (but I'll give you some tips later if you don't mind) it's about something many of us take for granted - The Intimate Home. The Intimate home is not about size, big isn't necessarily bad, and small isn't always beautiful. Whether its an old mini flat or a brand new house or apartment, the Intimate Home is about creating and sharing cherished memories. It’s about shaping the great life you’ll love. As a couple both participate in adorning their home through wedding gifts, personal acquisition by diligence and industry, they mustn't forget to take pleasure in the fact that they jointly strive towards the gradual completion of their personal special space. To me, the paint in the rooms we painted is prettier because we achieve it together. The pretty plastic cereal bowls my beloved sister-in-law gave me are priceless. She chose yellow as the color for her kitchen and was given a yellow egg holder by her pastor's wife and it is so precious to her. This seemingly mundane earthly task, gave us an opportunity in pride and love to value each individual, gift, self-earned piece, connected as it is with memories of many a dear word, of many a necessary struggle which we have fought through joyfully and courageously side by side, and also of many a peaceful happiness! Use restraint with patterns and bright colours: Bright red might look good on your lips this season but not so good on your walls. Pictures: Contrary to the present "Blackberry culture" these come in handy not only for dps but for walls, fridges (use magnets to hold in place not cellotape) and mantlepieces.